Boise GreenBike Director Dave Fotsch is using winter as an opportunity to pull more than half the bikes off the street and give them proper seasonal maintenance. 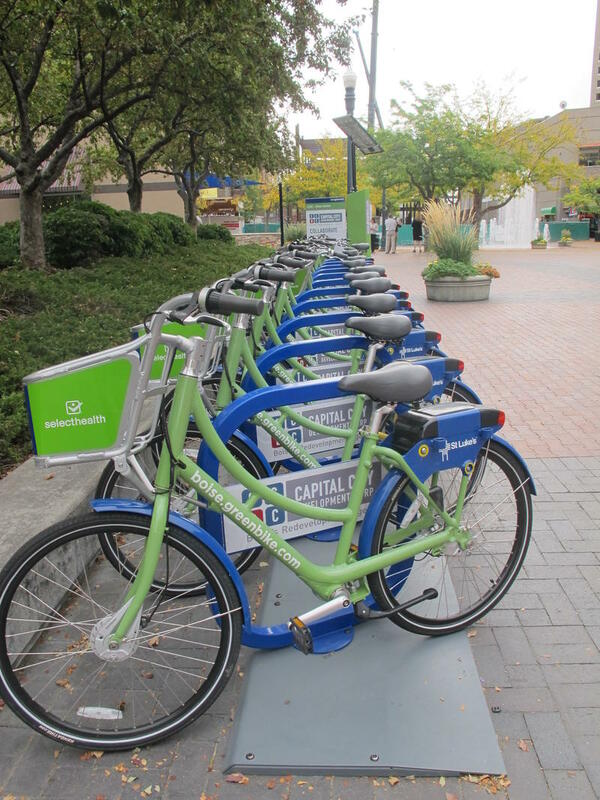 This summer was quite successful for the new bike share program in downtown Boise called Boise GreenBike. Riders pedaled more than 27-thousand miles on the bikes, taking more than 10,000 trips. But now that the seasons are changing and temperatures are dropping, the bikes are staying on the racks. It’s probably no surprise no one wants to ride a bike as much when it’s 40 degrees outside and raining. Out of the 114 bikes in the Boise GreenBike network, only 20 or so are getting a ride each day. That’s according to the director, Dave Fotsch. Fotsch is using the slow time to do some winter maintenance on the bikes, as well as fundraise for more racks to be installed next year. He says he doesn’t want to add more bikes to the network, but he does want more racks where the bikes can be stored without a fee to the rider. Right now, there are 15 hubs scattered around downtown. He hopes with more bike racks and some incentives for businesses to give their employees a low rate on an annual pass, ridership next summer will be even more successful. In the meantime, Fotsch is coordinating the Boise GreenBike Winter Challenge, a checklist of 25 things riders can do on the bikes in winter. Three months in, riders using Boise's GreenBike program have made almost 5,000 trips on the bikes. Dave Fotsch is the director of the program. He says almost 2,000 people have used the bikes since the program started in April. GreenBike lets people rent bikes around town, and is meant to improve the environment and users' health.